Radix have provided software development and maintenance services for over 3 years. Work has been in Linux/PHP and Android. Response, reliable and trustworthy. Good communication, reliable. All individual developers have been good quality. Radix team was subcontracted for a windows application involving graphics, reports, database, advanced user interfaces and they provide us a very good job in all aspects. Nice partner for me. Smartsourcing has been working with Radixweb for over 4 years. Radix have been trusted development partner for our organisation since very beginning. We have multiple projects going on with Radix at any given time and our team works with various teams at Radix who provide complete end to end solution right from designing to development to testing and ongoing support. Team at Radix has always gone an extra mile for us in making sure we achieve our project objectives. We would highly recommend Radixweb to anyone looking for IT development partnership and not just another vendor relationship. We look forward to continue to our partnership with Radix in future and achieve many more goals. There is always room to improve and they have always identified areas with us and worked on getting things right. Quality work, easy to connect with, quick responds and projects were done over expectations. They have a strong team. Role: Director at Solutions D'affaires Technologiques Exatech Inc.
Our agency has been working with Radixweb for several years and every project has been a great experience and success. Radixweb's team has been instrumental in accomplishing our projects from start to finish.The technical staff has also supported us over the years and delivered quality and timely service for our customers. I am looking forward in working with Radixweb's team for our upcoming software and web development projects. I recommend Radixweb as your premier business partner that will help you achieve your software development projects successfully. The staff at Radixweb are highly skilled and customer focused. They assign a project coordinator that facilitates the development, communication and the progress of the project. It has been a learning curve for both us and them. This willingness to push the boundaries and look for solutions is their key strength as a outsource partner. They adapt and solve problems within agreed budgets. We spent 1 week in the Design Phase in India where a core team of (2 developers, 1 senior leader and a graphic designer). Both the hospitality and professionalism shown was outstanding. This was a really important part of the set up of the project as it is a very bespoke piece of software. The projects and phases have stayed in budget because of this clarity and shared collaborative approach. At times we were challenged on our designs and alternatives were always suggested. They are an Indian software house that is looking to build relationships and they worked hard to ensure they understand who we are. We have moved this project through 3 discrete phases with weekly milestones and deliverables and I would recommend having an assigned project manager to oversee the work in India if you cannot be there. Ensure you set enough time aside to fully review their work to keep the project moving forward at pace. It took sometime for the relationship to develop and the challenge to be at the appropriate level. They should not be afraid of overcoming the cultural barrier and challenging a UK based client's thinking. Once the relationship had developed this became less of an issue. We have been working with Radix for almost 8 years. They are a compassionate and knowledgeable company committed to their customers. The implementation of their custom software and made a significant impact on our company and we would highly recommend their services to anyone looking for custom software development. ECAT has been working with Radixweb for over 7 years now. From the very beginning we established a strong and trusting relationship between the respective teams. There is ongoing support, multiple projects and an ethos of continuous development and improvement. We have always achieved our targets and budgets. We look forward to our continued success together in what is a great working relationship. Ability to deliver as agreed and an open and communicative approach. There is always room for improvement. The secrete is to accept that and do something about it. Radix continuously strives to do it better. 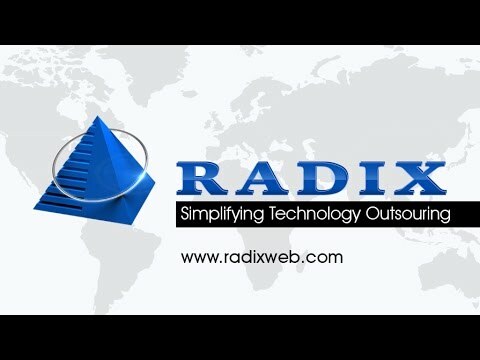 Giving a fundamental thrust to how companies attain, use, and leverage technology capabilities, Radixweb aptly combines great business acumen with technological insights to optimize organizational excellence and unprecedented growth for our global customers. Benchmarking success for 2750+ global customers since last 18 years, Radixweb has acquired nuanced software development expertise to critically understand the ways to achieve amplified growth for SMBs to Fortune 500 Companies. The resolute tech brains build innovative and value-based based software products that are Made to Last!